Does Your Cover Letter Make These 5 Critical Mistakes? Does your cover letter make these mistakes? You’ve polished your resume to no end, especially after finding a job posting that precisely fits your skills. But did your cover letter merit the same attention? Many hiring managers use your cover letter to gauge your interest in the company, as well as your aptitude for the job. Therefore, when you resort to “Dear Sir, I’m interested in your open job, here’s my resume,” you’re missing out on a critical chance to persuade employers to take you seriously. 1 – Your opening line was boring. “I am an Operations Director with 18 years of experience” or “In response to your ad for a CEO, I have enclosed my resume” really aren’t compelling enough to use as opening statements. The idea is to speak precisely to the employer’s pain points while describing the performance impact you’ve had in previous roles. Note that each of these sentences contains metrics, a targeted job title, and a career-defining achievement that is framed in context and laid out quickly for the reader to absorb. Your opening line should also leverage the research you’ve done on the company, per the next point. 2 – You didn’t demonstrate the ability to solve the employer’s problems. Rattling off a list of competencies isn’t strong enough to distinguish you from other candidates, but speaking directly to the company’s needs will do the trick. You have to dig into the company’s history, press releases, annual reports, and other news to figure out their pain points. What type of expansion is planned? Were earnings down in previous quarters? What do industry analysts say about the company’s future and their business strategy? 3 – Your key points don’t match (or exceed) the job requirements. Like resumes, cover letters must be precise and direct the reader… keeping them attentive to the reasons they should hire you and the edge your work can give them. While you’re writing, put the job description in front of you to remind yourself what the employer is seeking. Then, look for ways to point out how you can surpass these expectations. 4 – You didn’t address the letter to an actual person. Finding a contact name inside the company has never been easier. First, you can use LinkedIn’s Advanced People Search function to put in the employer name, then fill in the Keywords box to find potential contacts. For example, a Business Development Manager might look for keywords such as “VP Sales or COO” to identify the next-level manager contact, while an IT Product Director can try to find the CIO’s name. If you don’t find a name through LinkedIn, be sure to check Zoominfo.com, Spoke.com, or the company About Us page. If you have access to Hoover’s database or Dun & Bradstreet, you can also use these resources to locate company insiders. In addition, ReferenceUSA.com is a free contact name database available through many public libraries, and requires only your library card for access. 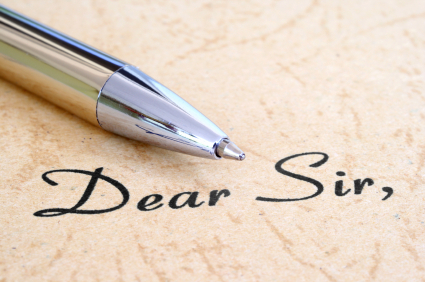 Taking the time to locate a name (vs. resorting to “Dear Hiring Manager”) will help your letter create more impact at a target employer. 5 – You forgot to be assertive. Especially if you’re pursuing an executive or senior-level role, employers like to see a take-charge style (the same one you’ll use to deal with vendors or your new team). If your closing line isn’t strong, you run the risk of looking too passive. “Thank you in advance for reviewing my credentials” is certainly polite and professionally stated. However, “I plan to exceed your requirements as your next Vice President of Finance” and “I am confident that I can demonstrate the leadership you look for in your next CIO” are both stronger. Even more intense, “I will follow up with you next Tuesday” shows definite intent on your part to influence the hiring audience, and gives them advance notice of the proactive steps you’ll take to secure the interview. To summarize, there’s no reason to settle for a bland, one-size-fits-all cover letter that blends in with the others. Your job search will fare better when you zero in on the hiring audience with an unforgettable opening—especially when it draws a parallel between employer needs and your unique value.